Riverton Cowl by Valerie Hobbs. 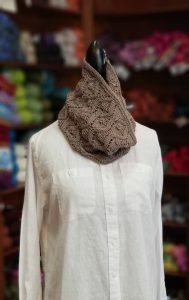 This beautiful cowl can be knit in a couple days with just 2 balls of this beautiful, squishy Trendsetter Merino VI and will make great gifts this holiday season. Let us help you pick out the right color for you!